In 1942 when Glenn Magner of Tangerine Woods mobile home park in Englewood, Fla. enlisted in the Army he was 16-years-old. He told them he was 20 and got away with it. For the next 22 months he trained for the war in Europe. 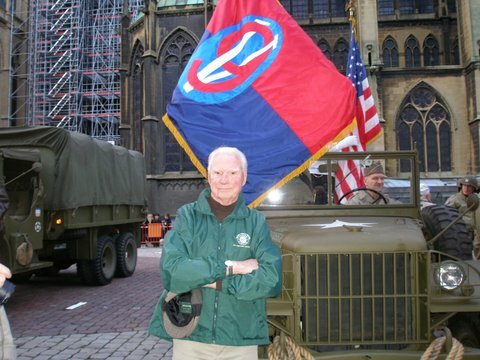 Magner was in Headquarters Company, 2nd Battalion, 379th Infantry Regiment, 95th Division. When there unit got to France it became part of Gen. George Patton’s 3rd Army. In October 1944 Sgt. Magner, who carried a 40 pound radio on his back and a Tommy-gun in his hands, found himself at Metz, France. The Germans captured the heavily fortified town that consisted of a trio of medieval stone forts. They had never been captured in battle and were built 1,000 years or more ago. On Nov. 3, 1944 Patton’s 3rd Army attacked Metz. Two weeks later U.S. forces isolated the forts and captured the city. In the battle German Gen. Heinrich Kittel was wounded and captured. “Our regiment’s objective was to go through the middle of the German lines and capture a supply bunker and a series of pillboxes on either side,” the 88-year-old Magner recalled. “My unit got ahead of our division and ended up on a hill above the forts surrounded by Germans. “They pounded the hell out of us. They hit us with artillery, machine-guns and mortars. After the third day we ran out of rations, water and ammunition. We were sitting ducks,” he said. “We had to be supplied by air after the third day. They dropped in D-Bars, water and ammunition so we could continue the fight. After the fifth day one of our units broke through the lines and got us out of there. “We were dead men walking when we were fighting the Germans. How long does it take you to get shot? I think they estimated a guy in combat life expectancy was about two minutes,” he said. Magner survived Metz without a scratch. He wasn’t as lucky during the Battle of the Bulge. Things started looking up for the young sergeant when he was transferred to another hospital in downtown Paris. It didn’t take him long to begin hobbling around the town on a pair of crutches. By VE-Day (Victory in Europe) Magner was out of the hospital and part of the occupation troops at a little German town called Olfen. After a month of that he was sent back to the States and discharged on Oct. 23, 1945. 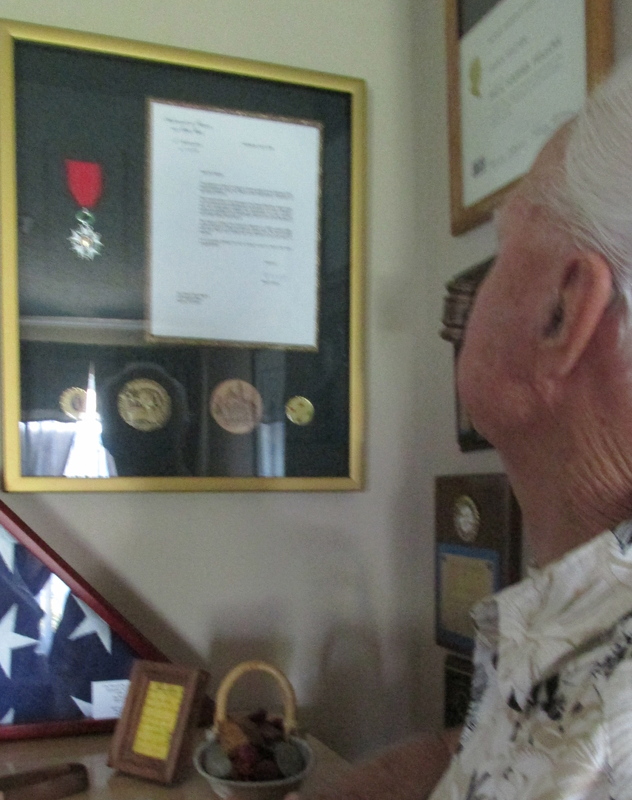 He served three years, three months and three days in the Army during World War II. “I was only 19 when I was discharged and had no education. The only thing I knew how to do was operate a radio and shoot people,” he said almost seven decades later. “I went to work as a stock boy at a department store in Minneapolis at 45-cents per hour. There were few jobs for someone with no education. “I told her I was sorry her son was killed in the war and left. “The following Monday morning I showed up at work with my battle jacket with four rows of campaign ribbons, a Combat Infantryman’s Badge and hash marks on my sleeve. 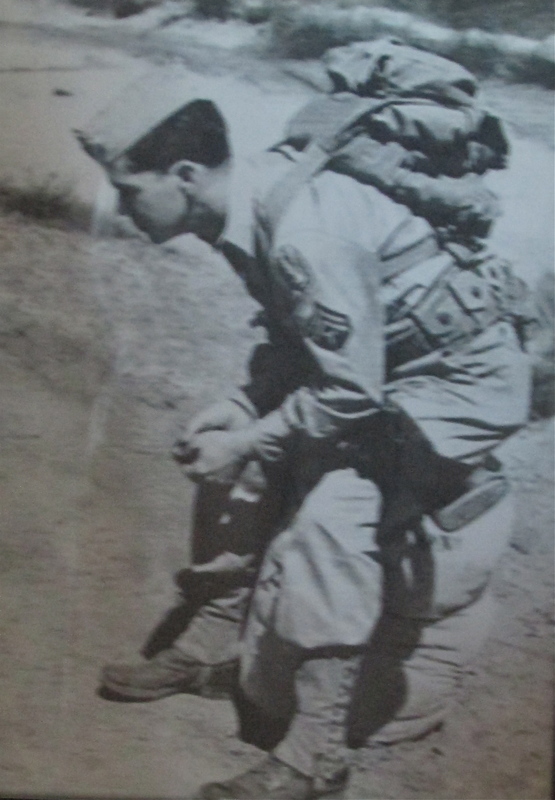 Magner knew he had to find a way to get some usable job training for civilian life. He re-upped, but this time he enlisted in the Air Force for three years. He became an air traffic controller. When he got out of the service the second time in 1949 he had to wait to sign up as a civilian air traffic controller because he was still only 20 years old. 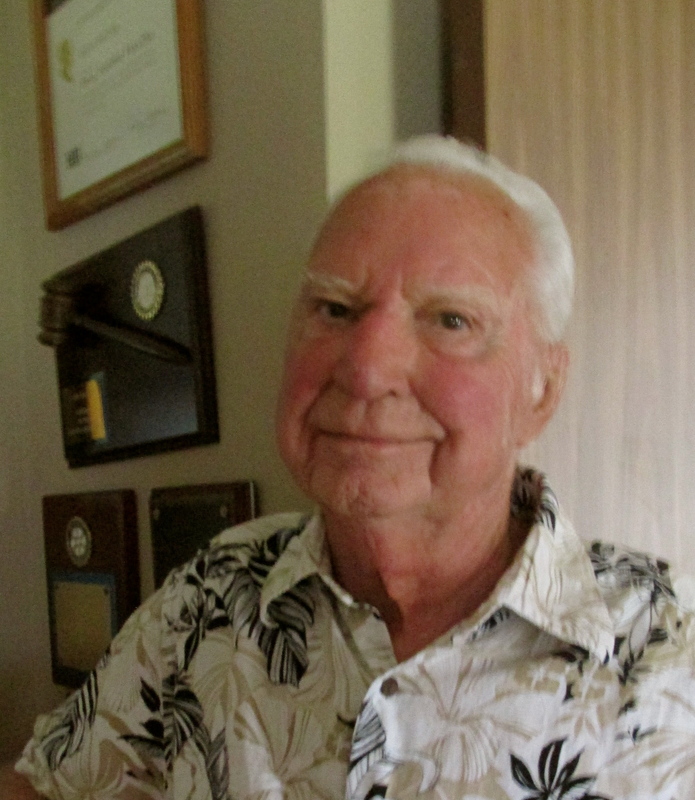 He spent the next 26 years working as a civilian air traffic controller. Magner and his wife, Lee Ann, moved to Tangerine Woods two years ago. The couple has one son–Kevin. This story was first published in the Charlotte Sun newspaper, Port Charlotte, Fla. on Monday, May 26, 2014 and is republished with permission. Click here to view Magner’s collection in the Library of Congress. Thank you for your service..My Dad too fought right along side you..He served 38 months in the 95th Infantry Division from training in Texas to California to West Virginia before being shipped overseas..He fought at the Bulge, Metz, Utah and Omaha beach..He told me that they FROZE their asses off during the winter since All they had were there summer fatigues…He was my true HERO and I think of him daily and no words can express how I truly LOVED my Dad..He passed away in 2009 at the Grand old age of 93 yrs.. He was truly blessed after the war to retire after 38 yrs with the Teamsters Local 407 out of Cleveland Ohio and retire from Preston Motor Freight and was truly blessed with 33 years of an awsum retirement with his wife and my MoM,, Mary of 68 yrs…She too passed away in 2011..May my parents of that Grand Era and All the others that have since passed on Rest in Peace and may they ALL live on in our hearts until we once meet again..May GOD BLESS you SIR….. It was very interesting for me to read your story, especially regarding Metz. I’ve researched that event very deeply. I’ve been trying to determine the details of my uncle’s Army service. He was SSgt. Martin T. Rasmussen. H Company, Second Battalion, 378th Infantry Regiment. It sounds like you must have been caught up in the same situation as he. He was KIA on 14 Nov 1944, three years before I was born. I hope to hear from you regarding your situation on 14 Nov 44, and also if you happen to have known my uncle as you were in the same battalion. Thanks for your service and may God continue to bless you! There is a mistake in my post of 6.09.15, above. My uncle was with the 379th Infantry Regiment, not the 378th. Baylus C. Fultz (My dad) was wounded in Saarlautern, Germany, Dec. 4, 1944. The info I have is 95th Division, 379 Reg. Was this your group? Unfortunately it’s unlikely Mr. Magner uses the internet and that he would see your question. Is it possible that you could pass on questions to him? He may remember. My Uncle Johnny Randazzo served in the 379th as well, and was killed at the Battle of the Bulge. It’s heartening that someone might have known him. He died before I was born. I know his last remaining sister who is 94 this year would love to hear. Hi, My Daddy, also in 379th was KIA 12/10/’44 next to Saarlautern, in Fraulatern, Ger. In house to house combat. We did not know of any details for 50 years. He was reburied in France on my 2nd birthday. I am so proud of him and all those men who fought to keep us free ! Thank you for sharing about your father. Too many good men lost their lives in WWII. We’re sorry for your loss. My Daddy was killed 12/10/44 in Fraulatern, Germany. Same area. 379 INF. My Uncle Alfred was also in the battle at Metz with the 378th. I have copies of his Bronze Star letter from a battle near Feves. And a copy of the 95th division citation from Gen Patton. How can I find out more information on where he might have fought over there?